A moving afternoon at the Oregon Historical Society, where the cross pollination of a World War II exhibit and the history of the state itself produced a very convincing portrait of America and American life. Our history has given so many of us the opportunity for greatness, and the exhibits made it clear that making good decisions is the basis of what we end up considering heroic. As I review my life, perhaps overly so, thanks to the endless time my absurd poker career provides, I can only hope to make this decade the one that finally counts and sticks. I would happily trade my remaining years to have accomplished more. This delicately drawn beauty draped in the flag would inspire any man to leap to the defense of his country and any woman to the seriousness of the cause. In this WWI poster she, standing in for desire (publicity and advertising wisdom has never changed), is the ambiguous idol and angel, untouched and unhardened. The verbiage of Summoning and Comradeship, straight from the great and problematic liberal himself, the language of youth and hope, is matched to her visual idealism. Yet in the second round of horror, the darkness of the matter is already assumed, and the stronger colors and sharper lines reawaken the monsters we just encountered in others and in ourselves. We are already successful and it is action that is idealized, not the angel of femininity. She is the wife with an attractive but slightly masculine cast, the present holding what the past has created. Death and seriousness change everything irrevocably. Just as America lost some bliss of innocence, so did even her propaganda. Of course, some things are just fun. 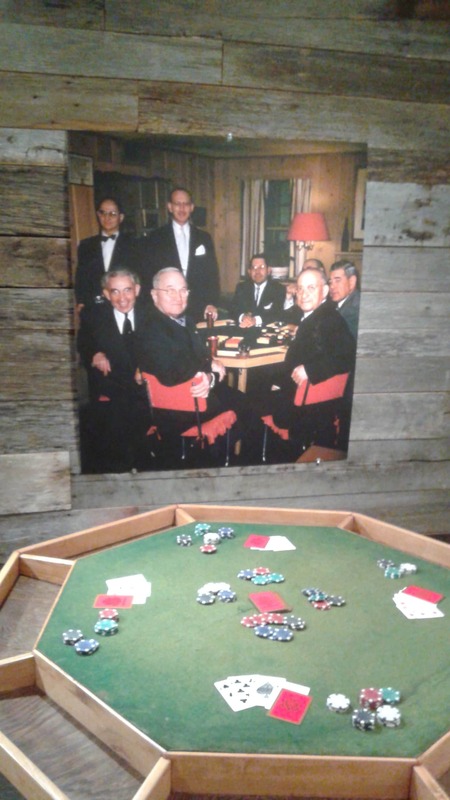 President Harry Truman’s modest poker table, hidden away in Kilroy’s Corner, in this minor gem of an exhibit. Detail hard to see: the cards are custom designed for the White House.